This client had a new opportunity to work with customers in the pharmaceutical industry and went to their bank to extend their credit line. The bank refused due to the sales concentration risk with several large accounts. They had to either pass up the opportunity or find working capital elsewhere. 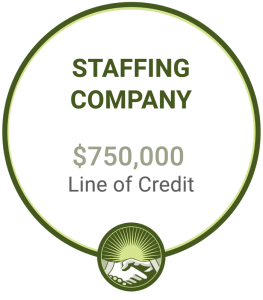 Client: Established staffing company headquartered in New Jersey. Situation: This client had a new opportunity to work with customers in the pharmaceutical industry and went to their bank to extend their credit line. The bank refused due to the sales concentration risk with several large accounts. They had to either pass up the opportunity or find working capital elsewhere. Solution: Grace Capital provided a $750,000 line of credit, replacing their bank at very attractive rates with minimal burden on the client during the transition. Result: The company is doing well and expanding, taking on even more big pharmaceutical clients and staff without worrying about how they would meet payroll and other expenses. Let us help you launch, grow, succeed. Trusted finance partners building successful tomorrows.